Weekend bookings available by appointment. Call Melbourne CBD’s Lawrence Chiropractic Clinic to book your appointment today! At Lawrence Chiropractic Clinic’s Melbourne CBD clinic, you’ll enjoy the same welcoming atmosphere and gentle chiropractic care as our patients receive at both of our clinics! 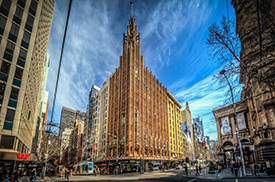 Our comfortable Melbourne CBD office is located in the historic Manchester Unity building. Chiropractors Dr Ernest Lawrence, Dr Andrew Lawrence, and Dr Laura Lawrence, as well as our Manual Therapist Mr Daniel Seaton, see patients at this office. 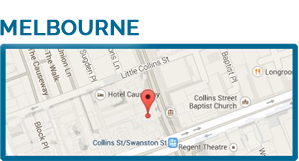 Our Melbourne CBD office is on the 9th floor of the Manchester Unity building on the corner of Collins and Swanston St., opposite the town hall. In the lift you might hear the comment “up to 9 to straighten the spine”. You can find us right on the tram line. 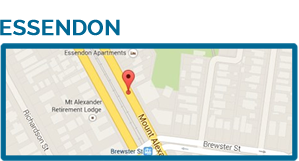 Interested in learning more about our Essendon or Melbourne CBD office? Contact us today!